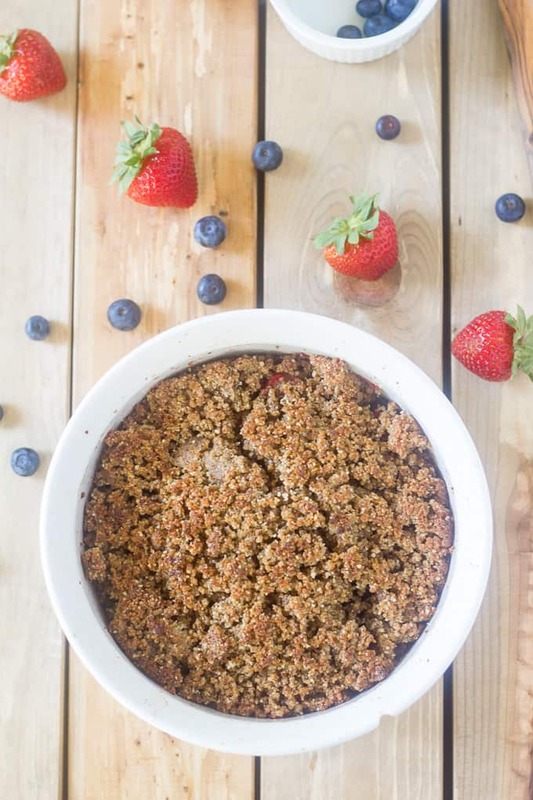 A simple and healthy Berry Crumble Breakfast Bake made with fresh berries and a grain free, Paleo and vegan crispy crumb top! Enjoy this any time of day – it’s perfect for breakfast, snack, or dessert! Now that the weekend is over and my kids will all be in camp during the day for the next 3 weeks, I’m ready to get serious. About what? Well, I haven’t figured that out just yet (it’s the first day, after all) but I think I’ll start with berries. 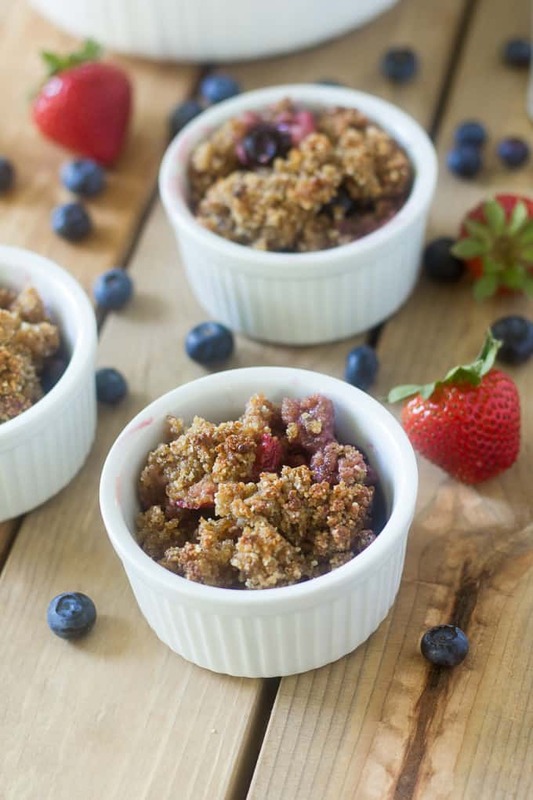 Specifically, today’s recipe for this way-too-easy Berry Crumble Breakfast Bake. 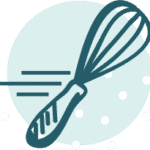 I originally had no intention of creating a dessert recipe that could double as breakfast, or a breakfast recipe that you could call dessert. But, I did just that. 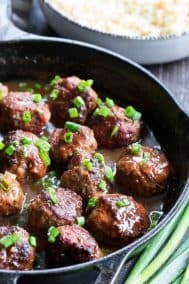 I wanted something using fresh ingredients with very minimal added sweetener. Berries are just so incredible on their own this time of year and deserve their time to shine! 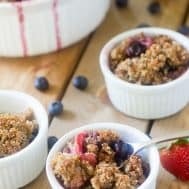 With this berry crumble, the berries totally shine, but the toasty, crispy and sweet crumbly top certainly does not hurt. The topping is very easily made in just 2 minutes by putting the ingredients in a food processor and literally just sprinkling it (well, generously sprinkling it) over the fresh berries. 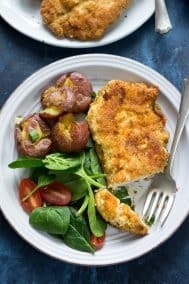 The crumble top is similar to the crust recipe I used for my Key Lime Pie and it’s tasty, versatile, and really simple! I like to tweak based on what I’m making and it’s always a winner. This time around, I used dates with walnuts and almond flour and it came out crispy, toasty and perfect. 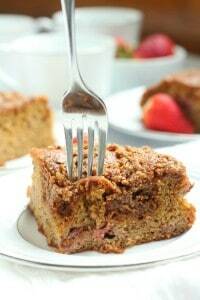 This breakfast bake totally reminded me of oatmeal or baked oatmeal, yet is totally grain free! 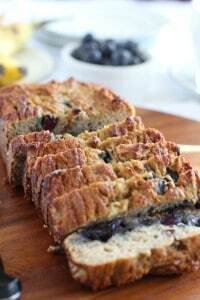 And, if sweet breakfasts aren’t really your thing (hand raising) this is also a perfect healthy snack or dessert. Let’s get started! 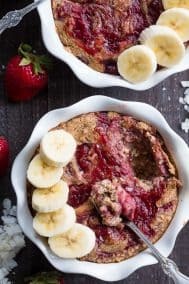 A healthy grain free, Paleo and vegan berry crumble breakfast bake made with fresh strawberries and blueberries with the perfect toasty and sweet topping that makes it perfect for breakfast, snack or dessert! 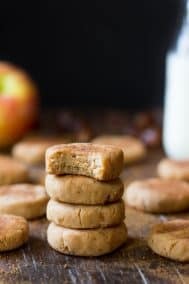 To make the topping, combine the softened dates, walnuts, almond flour and vanilla in a food processor and process on high until a crumbly paste forms. Place the fresh berries in a 1 and 1/2 quart baking dish and toss with the tapioca starch, and 2 tsp pure maple syrup if desired. 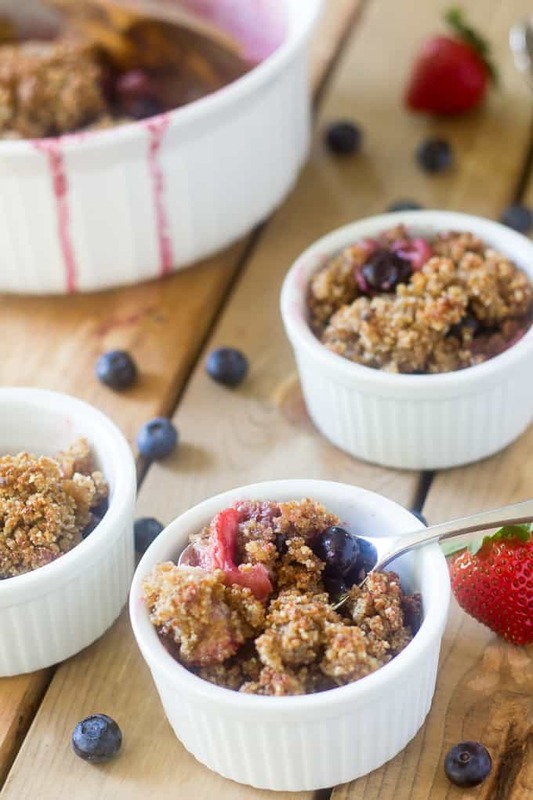 Generously sprinkle the crumb topping over the berries using the entire mixture. 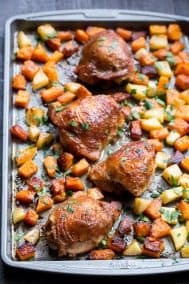 Cover the top with aluminum foil and bake in the preheated oven for 10 minutes, remove the aluminum foil and continue to bake another 10-15 minutes until the fruit is hot and bubbly and the top begins to brown and turn crispy. Remove from oven, allow to cool and serve warm. Store leftovers covered in the refrigerator. Enjoy! *To soften the dates, soak them in a small amount of water and microwave for 20-30 seconds, then drain. 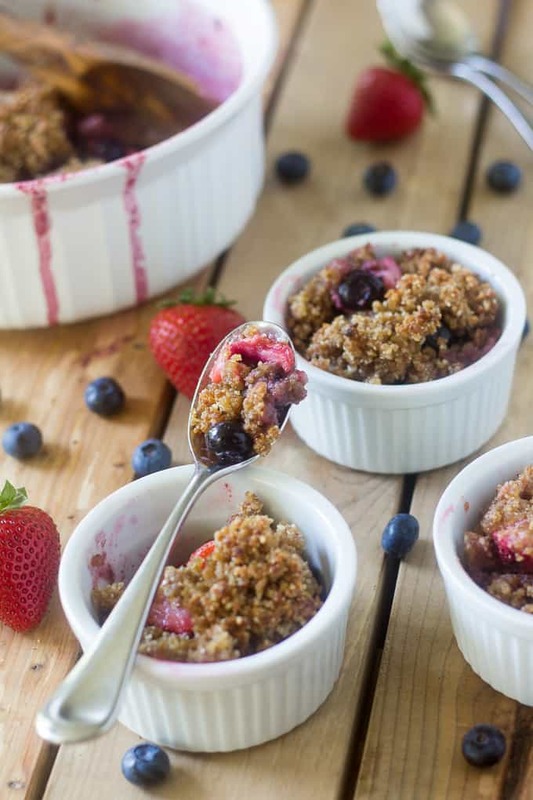 Want more baking recipes for your favorite berries? Try one of these! Love the new blog design! I think this would be perfect on a day when I am in the mood for a sweet breakfast- although that rarely happens:) it would definitely make a great dessert too though! 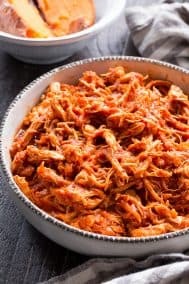 Holy yes this sounds great – for breakfast or just anytime really (like hi making a big batch and bringing to a cookout!). My holiday weekend was good, super low key which is just how I prefer it! Enjoy the greater amount of free time while your kiddos are at camp! I also love a low key weekend if I can get one – I live for that! This sounds epic and I’m loving your new design! I am ALL about those desserts for breakfast! I tried going the savoury route first thing in the morning a few times, and it just doesn’t work for me… If I don’t get some sort of sweet fix, I’m in the kitchen 30 minutes later looking for something. Thankfully, fruit seems to satisfy the cravings just fine. Adam is definitely like that with breakfast and I’m sort of the opposite and need something sweet every night before bed! Haha, yes polka dots 🙂 A little late for the 4th but still good all summer! Fruit crumbles always look so lovely and yummy, but I never make them!!! What’s wrong with me!? Oh that has to change, perfect time of year since there’s fruit overload! Oh my, this looks so good! 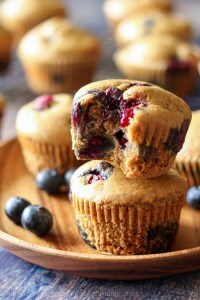 And I just ate my last banana-blueberry muffin this morning so timing is perfect. I do have to find an alternative for the walnuts though (I can’t do any kind of nuts), but will look into that! 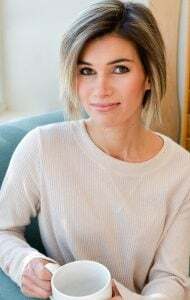 I like your new website! Aw, too bad no nuts! And thanks 🙂 I do have a nut free banana recipe coming up soon! Woah, you changed your site! I love it. Also, I love any berry crumble. Apple crumb pie is one of my favorites. I am all about crisps, crumbles, and cobblers this time of year. Bring on the fruit. Also, I love how few ingredients you have here. This is the best crumble topping I’ve ever had. Thank you!!! I just made this for breakfast using fresh blackberries instead of strawberries and blueberries. It was wonderful! 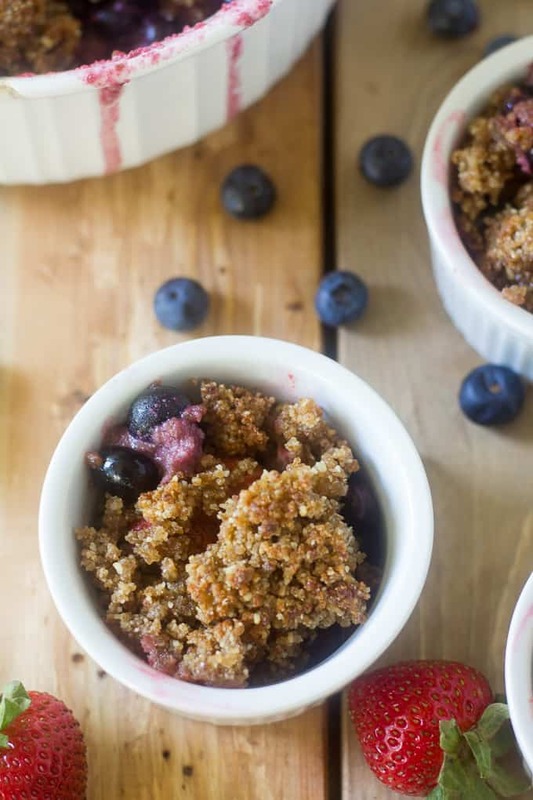 How did you get the crumble part to be so crumbly? Mine came out with a very paste like texture because of the dates I think. Taste was great, but didn’t get the crumble right. The topping is sort of a crumbly paste before baking but after baking it definitely resembles crumbs. I’d say if you try it again to use a bit less dates and a bit more almond flour for a drier mixture. This was delicious!! So simple and easy. I threw a handful of flax seed meal into the topping as I mixed it up. 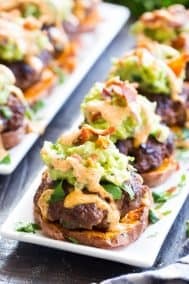 Even my family who rolls their eyes at “gluten-free” and “dairy-free” loved it. I can’t wait to try it with other summer fruits. (Peaches, anyone? With pecans??) Thank you for sharing! This was amazing! I made it without the maple syrup since I am trying to cut out all added sugars, but with that delicious crumble, you don’t miss it at all! 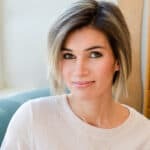 As a self proclaimed sugar addict, this journey has been a difficult one, so when I run across a recipe like yours, it’s like a little burst of happy! Thank you so much for sharing! Thank you Veronica, I am so new too this and I am missing my sweets so badly. 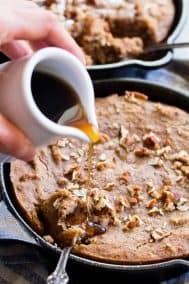 This recipe sounds fantastic but my MD does not want me even using maple syrup or honey right now, so I will try it like you did!!!! My kids loved this! We made it for my son’s 2nd birthday. He was covered in berry but sooo happy!